Here is the cake I made for the end of year party for my daughter's twelfth grade class, my friends gave at their beautiful home. Marble cake has special significance for me ... It was the cake my Mom made through the years on our birthdays. I love it and I hadn't made it in some time. My friend who made the food for the party, Chef Bobo, the kids' chef at their school, wanted me to make it because I made it for a school event some years back and he really liked it. So I thought, this will be the last cake I make for a high school event for my daughter. Let it be marble! I made my lemon cake recipe... I omitted the lemon altogether. I then made the simple syrup without the lemon and used that to moisten the cake. I made two 14 inch cakes. Each layer was a double recipe. I used 6 Tbs. cocoa with 1and1/2 cups of batter for each of the two cakes. I swirled this amount into each layer. I baked them for about 40- 50 minutes. I let them cool, then sliced them diagonally in half and had a total of 4 layers. I made ganache with 3 Lbs. semisweet chocolate and 3 cups of cream. I spread the ganache evenly between the layers and on the top and sides of the cake. I covered the cake with milk chocolate curls, dusted it with confectioners sugar, and there you have it! I got a standing ovation for the cake that evening. So glad they all liked it! Maria has left GMA. She is embarking on a new and exciting journey. We thought it was befitting to take her out for a goodbye lunch. We have all often bonded and enjoyed lunches together during our tenure together. We not only worked very hard and well together. We became friends in the process. I hope our paths cross again, but in the mean time best wishes and luck must suffice. Maria possesses some fine organizational skills, and one of the things I loved most about working with Maria, was that she made it her business to work ahead and always kept me informed of what was coming up. This made it possible for me to plan the rest of my life. Thanks don't begin to describe my gratitude. xoxox You will be surely missed! Here are some of the delicious treats we shared. The bread was outstanding and the pithy olives robust! The red wine was an excellent Cortino. These are some briny, and tender clams in a rich tomato broth. The salad was excellent, mizuma with wild boar proscuitto, and bits of goat cheese, loved it! This was a radicchio Caesar salad, bountiful and biting! These were sauteed diver scallops with escarole and an excellent celery root puree. This dish was stellar! An excellent but bittersweet afternoon! Today the lovely B. Smith graced our studio. The segment she did was part of a mother's day whip: small segments with big ideas for mother's day. I set up the food for the segment. The lovely and gracious Ju Ju, made my daughter Marjolaine, feel most welcome, and B. Smith before the segment. B. Smith's french toast with strawberries and mint, is in the foreground that I made for the segment. 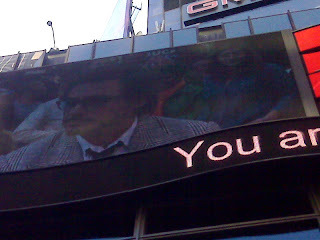 Robert Downie Jr. and Marjolaine in the Jumbotron! 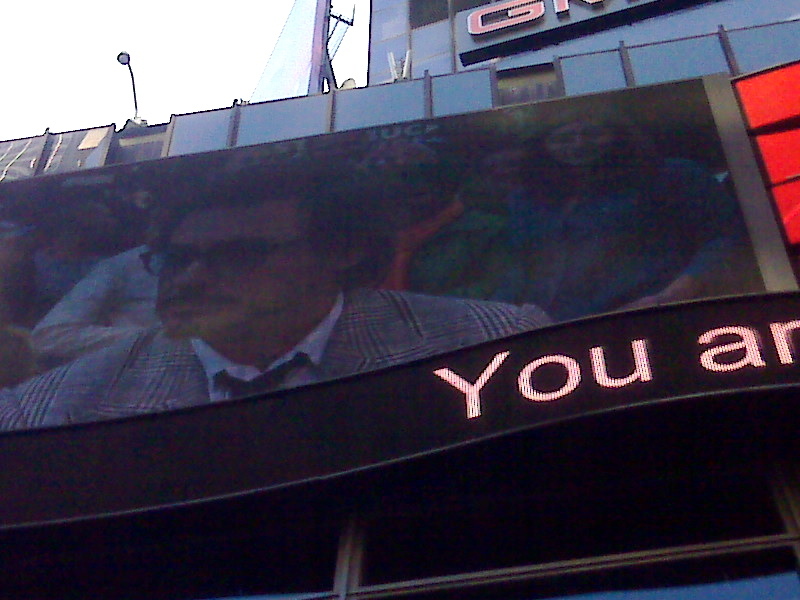 in Times Square! When Beanie Came to GMA this Thursday specifically to meet Robert Downey Jr. she was thrilled to get his autograph. What a morning she had. My illustrious cohorts at work helped make her morning what it was for her and I want to thank them by showing off how lucky I am and she too for having these folks in our lives.